Raised to adulthood during the end of the war between the human Polity and a vicious alien race, the Prador, Ian Cormac is haunted by childhood memories of a sinister scorpion-shaped war drone and the burden of losses he doesn't remember. Cormac signs up with Earth Central Security and is sent out to help restore and maintain order on worlds devastated by the war. There he discovers that though the Prador remain as murderous as ever, they are not anywhere near as treacherous or dangerous as some of his fellow humans, some closer to him than he would like. Amidst the ruins left by wartime genocides, Cormac will discover in himself a cold capacity for violence and learn some horrible truths about his own past while trying to stay alive on his course of vengeance. 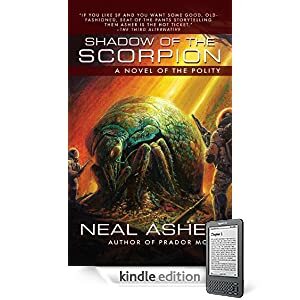 Or purchase Shadow of the Scorpion as a DRM-free e-book in the format of your choice through WebScription.net.